The ‘Indigenous Peoples Trail' is in Ramechhap District of Nepal. The first of its kind in Nepal, the ‘Indigenous Peoples Trail’ offers unique, living, exposure to one of the most culturally diverse areas of Nepal. The ‘Indigenous Peoples Trail’ offers scenic trekking at relatively low elevations, below 3000M. Bound by Thulo Sailung peak in the North, the golden Sun Koshi flowing along the South and the Tama Koshi in the East, the ‘Indigenous Peoples Trail’ presents an incomparable and natural blend of cultural, linguistic and ethnic diversity coupled with breathtaking Himalayan panoramas, stretching from Dhauligiri and Annapurna in the West to Numburchuili and Kanchenjunga in the East. 57.9% of the total populations in Ramechhap belong to indigenous communities. Out of the total 55 VDCs, indigenous populations are in majority in 34 VDCs. In all, there are 21 indigenous groups in Ramechhap. Ramechhap district falls within the territory what is historically known as homeland of indigenous Tamang nation, they form the largest size. Tamang Peoples constitute about 21% of the total population. In Ramechhap visitors gain memorable insight into the culture and lifestyle of at least six indigenous communities: Sherpa, Newar, Thami, Tamang, Yolmo and Majhis. Among these groups, the Thami and Majhi are rarely encountered on trekking routes anywhere. Against a magnificent Himalayan backdrop visitors gain invaluable insight to the culture and lifestyle of several local Indigenous Peoples including Tamang, Newars, Sherpa, Thamis, and Majhis. The two predominant religions, Hinduism and Buddhism, are ever present with the variety of gods and goddess, temples, stupas and monasteries. Rise early to reach the summit of Thulo Sailung as the sun rises over the Eastern Himalaya. 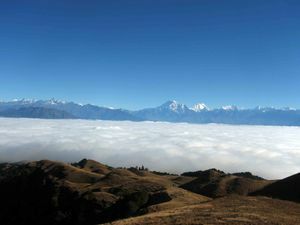 At 3300m Sailung offers magnificent views over Kalinchowk to the Annapurna, Langtang, Ganesh Himal, Rowaling, Everest and Kanchenjunga ranges, to the South the Mahabharata hills roll over the Sun Koshi River and down to the Terai below. Thulo Sailung is regarded by the Tamangs as the abode of the territorial deity, Sailung Phoi Sibda Karpo, Sailung’s ‘White Male Lord of the Earth’. The chorten atop the hill of Sailung is the seat of this divine protector and the Tamang Community are the ‘custodians of the land’. The souls of the ancestors together with the ‘Lord of the Earth’ guarantee the well-being of the people and the fertility of the soil. The four groups of stone chorten on the summit are related to the Tamang Communities in the surrounding area – the groups on the highest point facing south over Ramechhap, today in ruins, are the largest. At the chortens Buddhist Priests perform ‘mandala offerings’ for the rebirth of the souls of the deceased. The lingos surrounding the Chorten were erected during Tamang death rituals and are left there to succumb to the forces of nature. The main rituals held here are Buddhist offerings to the souls of the deceased. During the festival of Saun Purnima, held on the full moon of July/August during which Tamang pilgrims crowd around the ruined Chortens at the highest point of Thulo Sailung. Nowadays, no blood sacrifices are permitted on Thulo Sailung. The shamans have surrendered to Buddhist Dominance and refrain from offering blood to the fierce female deities. Other sites of interest around Thulo Sailung include three rocks - tiger, snake and cow representing the Hindu, Buddhist and Shamanic simultaneous rivalry and co-existence. The King of the Tigers lived on Thulo Sailung. One day he was pursuing a cow grazing on the meadows of Thulo Sailung. Suddenly a snake appeared from the soil and came between the tiger and the cow. The three turned to stone and the cow was saved from the tiger. Two rocks below Thulo Sailung bear the footprint of Padmasambhava and his sword. Gaurighat cave Located below the summit of Thulo Sailung is Gaurighat cave, it is believed that on full moon nights ‘milk’ is said to ooze from the stalagtites inside the cave. The cave is believed to be a source of fertility and health. Pilgrims pray there for sons, relief from illness and for personal success and wealth. The cave is also considered the entrance to the netherworld, the realm of the nagas serpent deity. Legend has it “when a yogi meditates inside the cave for five years, a door leading to the interior of the mountain appears”. Buddha’s Gate A second cave locally known as ‘Buddha’s Gate’ or the ‘Door of Dharma’ has an exit hole that almost too small for human passage. Only the most devout Buddhists who have not committed any sins can pass. Squeeze through in the hope of ridding yourself of sin and emerge pure! Godavari cave In the third small cave, Godavari cave, it is believed that every twelve years at the full moon of August/September white water is said to flow in which Hindu’s take a sacred bath to ritually purify the body. These caves are also associated with the Hindu God Mahadev, the popular form of Shiva, together with his female consort Seti Devi, the ‘White Goddess’ Parvati. A shepherd discovered his cow was giving milk a large phallic rock inside the cave. According to legend the rock was Mahadev himself. Enjoy lunch in Khola Kharka and continue along the trail, passing through rhododendrons downhill to the Monastery in Raj Veer Built by the Bhutanese Drukpa Kagyu School in 1972. The craftsmen responsible for the paintings and frescoes came from Bhutan. The patron Lama Kalsang of Kathmandu's Dharma Centre has donated comfortable accommodation quarters where you will spend the night. Rise early to the sound of chanting Monks and receive a blessing before continuing on your journey. Continuing downhill from Raj Veer Monastery the trail leaves behind the thick alpine forests and opens up to the green terraced fields. Along the route you pass through the Sherpa village of Dadhuwa-Dara and a Tamang village, each with their own Buddhist gompas. Prayer flags, chorthens and mani stones are scattered along the route. The trail continues to descend where the spectacular 40 foot 'Thinghare' water fall crashes onto the rocks below. A short climb brings you to the beautifully terraced settlement of Surke where you will spend the night in one of five newly renovated homestays. Spend a day in the village, climb to the viewpoint of Gaurigaun or visit the endangered Thami Community. The local Thami band are on hand to entertain and visitors can sample the local Raksi! Thangmi, known in Nepali as Thami, is a Tibeto-Burman language spoken by around 30,000 people in eastern Nepal. Unfortunately, much of this local knowledge is falling into disuse as fluency in Nepali increases, see the Thami phrasebook and surprise the locals with a few words in their native tongue! As you leave Surke you pass through Thami Settlements before crossing over into the Doramba valley where the trail traverses along the forest covered hillside around to the terraced fields of Doramba. The trail leisurely follows the contours of the valley leading to the bustling Doramba Bazaar, where you can purchase cold drinks, snacks and music cassettes of local Tamang songstress, Shashi Moktan. Tonight you will sleep in a local homestay. Doramba is one of the largest Tamang settlements in Nepal, in fact, most of the Thangka painters found in Bhaktapur and Bouddha are originally from this remote village. Try your hand at a few words in Tamang with the Tamang phrasebook. After a pleasant walk out of the Doramba valley, the route ascends to the sacred Hindu shrine atop Agleshwari Danda where you will be rewarded with stunning views of the Himalaya and the rolling Mahabhata hills below. Descend through the local slate mine, through pine forests to emerging at Galpa Bazaar. Perched on a pass between two valleys Galpa Bazaar is a bustling centre where you can purchase cold drinks and snacks, an ideal place to break for lunch. Perched on top of a 1977m peak, Khandadevi is situated around a captivating Hindu Temple complex encircled by ancient stone walls. The temple, dedicated to Goddess Khada Devi, was discovered in 1458 AD by a shepherd who discovered milk oozing from a sacred stone, an emanation of the Goddess Khandadevi. The site served also as a fortress during the Anglo-Nepal war. The setting is dominated by high hills of lush green Maharabharat Range with snowy peaks of Numburchuili and Gaurishankar on the northern horizon and southern views over the flat terai below. Daily animal sacrifices, Panchabale, are still carried out today. As of spring 2009, there is one homestay where you can spend the night. Leaving Khandadevi, the trail follows a long ridge with views down into the Terai on one side and up into the snow capped Himalayan peaks on the other. The trail traverses up and down through thick alpine forests before crossing into another valley. Amidst the forest you encounter an enormous rock adorned with a Shiva temple before emerging at Dhonghme, an ancient Yolmo or settlement, inhabited by many Lama's. The local Lama may show you his vast collection of Buddhist scripture and photo's from recent trips to Bodhgaya. Like the young Tamang's much of the Yolmo youth are employed as Thangka painters in Kathmandu. In the evening, make the gradual climb to the summit of Sunapati, well-know for its spectacular sunrises and sunsets. Here amongst the Buddhist Chortens and Hindu shrines you can enjoy sunset over the Himalaya before returning to the Gumba or homestay to spend the night. After breakfast the next morning you get to enjoy an equally stunning sunrise before the final descent to the village of Lubughat on the renowned Sun Koshi River. Here you will meet the Majhi peoples, renowned for their fishing expertise. Roaming through the rivers, men, women and children repeatedly hurl nets into nearby water in hopes of trapping passing fish. You will spend your last night here, in lubughat before rising early, crossing the river to catch the bus to Dhulikel where you can enjoy the luxurious hotels and stunning Himalayan views, before returning to Kathmandu. All food and services are locally produced, virtually all of the money stays in the community. Though there are small shops, where one can buy snacks and drinks, in most of the villages along the way, none of those sell water. So be prepared to boil water at the homestays. Home-stay accommodation and cultural performances offer closer contact with Nepali hospitality and greater insight into ethnic lifestyles that cannot be found along the more developed trekking venues where interactions can be more commercially orientated. The ‘Indigenous Peoples Trail' allows you to stay overnight in private homes in traditional villages far from commercialized tourist trails. Unlike highly commercialized routes trekkers walk through uninhabited areas and meet few fellow travelers. Accommodation on this trek changes in each village and is either in a local family homestay, a monastery, or a community homestay, all of which were upgraded through the UN-ILO EmPLED project to meet international tourist standards. Hygienically tiled toilets are available at all accommodation options. Rural Nepali’s have a traditional love for meeting people, making new friends and welcoming guests into their homes. In turn, for many Nepali as well as visitors to Nepal, there is little that is more interesting than staying as guests in a traditional Nepali home. When staying with a Nepali family guests live the life as the local people do, and are treated like part of the family. Homestays provide an authentic visitor experience that directly improves the lives and heritage of local Communities and aims to discover the real Nepal and to enjoy the untouched and undisturbed country-side. The homes are not hotel-like; instead they reflect the traditional and simple atmosphere of the people. Apart from the pleasure of being amidst peaceful and serene environment, tourists can also enjoy the traditional folk dances and music presented by the local men and women. The focus for the guests is on experiencing and learning from an authentic and enriched culture. Visitors are often involved in local activities that range from cooking classes through to attending a traditional wedding, watching a local cultural dance. In addition, the program increasingly responds to the growing interest among urban Nepali to rediscover, taste, appreciate and maintain contact with their rural roots. Initially five homes in each select target villages were provided with grant support for infrastructure upgrading and skills development training in order to raise comfort and hygiene standards to meet international tourist demands. Local people organize and host the visitors and therefore are the primary recipients of the benefits, financial and otherwise, that accrue from the tourism activity. In addition to the host families, many of the micro-enterprises in the locality also benefit directly from the influx of tourists and increase demand for their products. The homestay concept provides the ideal vehicle for visitors to experience the rural and traditional Nepali way of life, and for the local community to participate in and benefit directly from tourism. By staying at one of our Homestays a certain percentage of the accommodation price you provide is placed into a community fund to support further community projects as decided by the local village tourism development committee. The program also acts as an important mechanism to learn, share and conserve local values and customs. Activities that are performed for guests, could, in some cases, disappear from these communities which are increasingly influenced by the factors of modernization, urban sprawl and international development. It is hoped that the visitor's interest in the Indigenous Peoples culture will stimulate and maintain the locals pride of their distinctive culture and heritage. The highest elevation reached is 3146 m making the trail an all season trek (however, March to June and September to January are the best seasons). It is a relatively soft top-down, gentle trek fit for all categories of trekkers and particularly suited to visitors wishing to avoid extreme high altitudes within a week or less of holiday. This is a great trek if you wish to avoid extreme high altitudes. As the trek remains at relatively low altitudes there is little chance of altitude sickness. The final stretch of the trail crosses over the Sun Koshi and shortly ends at Nepalthok where your bus or jeep will be waiting. A pleasant 2 hour drive on the brand new hard-top road back brings you back to Kathmandu, through Dhulikel. This page was last edited on 6 November 2010, at 08:00.